It is widely recognised that Australia is experiencing an "extinction crisis". And the loss of species and habitat in this country is at extreme levels. This symposium asks: How do we think about extinction historically in this country? How do we think about extinction today? And how do we estimate its impact on our future? How do we articulate (and mourn…and prevent) the loss of species, habitats and ecosystems? Settler Australia understood extinction as the result of large-scale land clearance and the mass extermination of many native species. Today, extinction is understood in the framework of the Anthropocene: the extremes of climate change, the destruction of ecosystems, the extensive pollution of our soil and river systems, coral reefs and oceans. It can be difficult to think locally about these issues. But this may be where "extinction studies" is obligated to begin. Where it ends may be another story altogether. What are the stories about extinction that we are telling ourselves in Australia these days? This symposium brings together researchers and practitioners from around Australia and across a range of disciplines: biosciences, earth sciences, environmental science, urban studies, aquatic studies, Indigenous studies, the humanities and the creative arts. It aims to open up different approaches to extinction, with the hope of producing new dialogues between researchers and practitioners - bringing extinction, for better or worse, into the forefront of our consciousness. Bookings are required, places are limited. 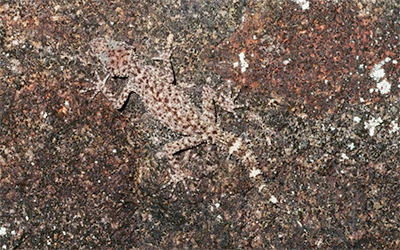 Image: A Gulbaru Gecko trying to be a rock. Conrad Hoskin, 2013.